oneway_onlyway, originally uploaded by ktieche. SF (not just Paris) has its fair share of cute guys on bikes! 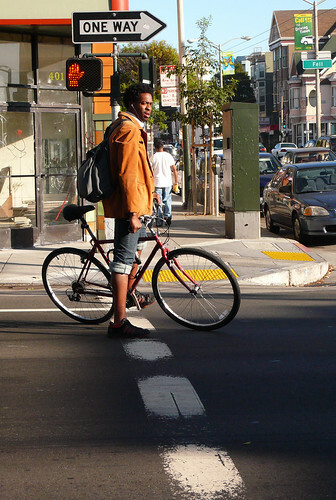 SF bike dudes can often be just as stylish as Parisians, they have an edge to their look. I don't know whether this hottie on his morning commute was giving me the evil eye or just squinting in the morning sun, but I like his look, in a brown blazer and rolled up jeans, listening to tunage on his iPod. Cool hair, too. is that a cord blazer? super!